Oh, Polly! 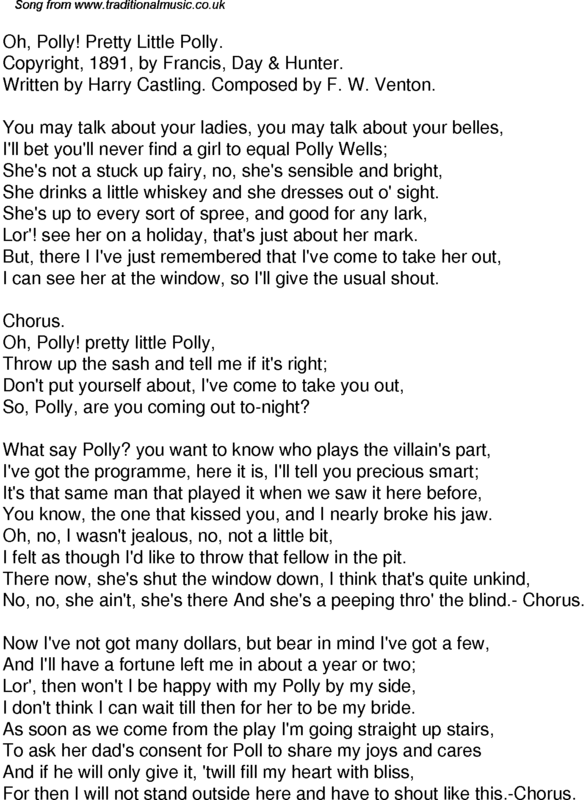 Pretty Little Polly. Written by Harry Castling. Composed by F. W. Venton. She drinks a little whiskey and she dresses out o' sight. Lor'! see her on a holiday, that's just about her mark. I can see her at the window, so I'll give the usual shout. So, Polly, are you coming out to-night? You know, the one that kissed you, and I nearly broke his jaw. I felt as though I'd like to throw that fellow in the pit. No, no, she ain't, she's there And she's a peeping thro' the blind.- Chorus. I don't think I can wait till then for her to be my bride. For then I will not stand outside here and have to shout like this.-Chorus.